The Action Team program began in 2003 as a way for the Major League Baseball Players Trust, the players’ collective charity, and Volunteers of America to inspire and train the next generation of volunteers. Each year through the Action Team program, Major Leaguers and students deliver a simple message to young people everywhere: You don’t need to be a celebrity to be a hero to someone else. To date, more than 73,000 high school students have helped more than 229,000 of their neighbors in need. Using their skills and resources, Action Team Captains plan and organize events to help fill needs in their communities. Not only do they bring compassion and civic-mindedness to their events and activities but imagination and creativity, as well. 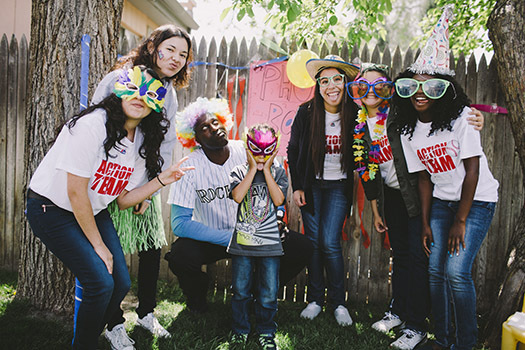 Whether it’s hosting a carnival for inner city youth, cleaning a local canyon or park, putting on musical performances for local residents or challenging a senior center to a Wii bowling tournament, Action Team Captains have been a positive force in their communities for more than a decade. In recognition of their efforts and dedication to volunteerism and to encourage academic achievement, the Players Trust each year awards multiple $2,000 scholarships to those Action Team Captains who best exemplify a commitment to serving their community. The scholarships are awarded based on Captains’ volunteer efforts, academic record and leadership skills. To date, the Players Trust has awarded more than $238,500 in college scholarships to Action Team Captains across the United States, including 18 scholarships last school year. If you’re an Action Team Captain or Ambassador, the winter school break is great time to complete and submit your scholarship application for the Jan. 12 deadline. Good luck. If you’re a high school student, or know one, and would like more information about the Action Team, please visit us at www.ActionTeam.org. The Action Team scholarship application can be found in the Action Team’s online Resource Center. To gain access to the Resource Center and scholarship application or if you have any questions regarding the Action Team program, please contact the Players Trust at 212-826-0809 or by email at actionteam@mlbpa.org.